For the river in Angola, see Cuanza River. For the currency, see Angolan kwanza. For the album by Albert Health, see Kwanza (The First). Kwanzaa (/ˈkwɑːn.zə/) is a celebration held in the United States and in other nations of the African diaspora in the Americas and lasts a week. The celebration honors African heritage in African-American culture and is observed from December 26 to January 1, culminating in a feast and gift-giving. Kwanzaa has seven core principles (Nguzo Saba). It was created by Maulana Karenga and was first celebrated in 1966–67. Celebrates African heritage, unity, and culture. American Black Power activist and secular humanist Maulana Karenga, also known as Ronald McKinley Everett, created Kwanzaa in 1966, as a specifically African-American holiday, in a spirit comparable to Juneteenth. According to Karenga, the name Kwanzaa derives from the Swahili phrase matunda ya kwanza, meaning "first fruits of the harvest". A more conventional translation would simply be "first fruits". The choice of Swahili, an East African language, reflects its status as a symbol of Pan-Africanism, especially in the 1960s, although most of the Atlantic slave trade that brought African people to America originated in West Africa. First fruits festivals exist in Southern Africa, celebrated in December/January with the southern solstice, and Karenga was partly inspired by an account he read of the Zulu festival Umkhosi Wokweshwama. It was decided to spell the holiday's name with an additional "a" so that it would have a symbolic seven letters. Kwanzaa is a celebration with its roots in the black nationalist movement of the 1960s. Karenga established it to help African Americans reconnect with their African cultural and historical heritage by uniting in meditation and study of African traditions and Nguzo Saba, the "seven principles of African Heritage", which Karenga said "is a communitarian African philosophy". For Karenga, a major figure in the Black Power movement of the 1960s and 1970s, the creation of such holidays also underscored an essential premise "you must have a cultural revolution before the violent revolution. The cultural revolution gives identity, purpose and direction." During the early years of Kwanzaa, Karenga said it was meant to be an alternative to Christmas. He believed Jesus was psychotic and Christianity was a "White" religion that Black people should shun. As Kwanzaa gained mainstream adherents, Karenga altered his position so practicing Christians would not be alienated, then stating in the 1997 Kwanzaa: A Celebration of Family, Community, and Culture, "Kwanzaa was not created to give people an alternative to their own religion or religious holiday." Many African Americans who celebrate Kwanzaa do so in addition to observing Christmas. Ujima (Collective Work and Responsibility): To build and maintain our community together and make our brothers' and sisters' problems our problems and to solve them together. Kwanzaa celebratory symbols include a mat (Mkeka) on which other symbols are placed: a Kinara (candle holder), Mishumaa Saba (seven candles), mazao (crops), Muhindi (corn), a Kikombe cha Umoja (unity cup) for commemorating and giving shukrani (thanks) to African Ancestors, and Zawadi (gifts). Supplemental representations include a Nguzo Saba poster, the black, red, and green bendera (flag), and African books and artworks – all to represent values and concepts reflective of African culture and contribution to community building and reinforcement. Ears of corn represent the children celebrating and corn may be part of the holiday meal. 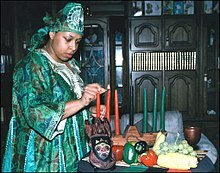 A Kwanzaa ceremony may include drumming and musical selections, libations, a reading of the African Pledge and the Principles of Blackness, reflection on the Pan-African colors, a discussion of the African principle of the day or a chapter in African history, a candle-lighting ritual, artistic performance, and, finally, a feast (karamu). The greeting for each day of Kwanzaa is Habari Gani? which is Swahili for "How are you?" 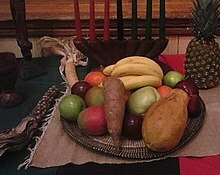 At first, observers of Kwanzaa avoided the mixing of the holiday or its symbols, values, and practice with other holidays, as doing so would violate the principle of kujichagulia (self-determination) and thus violate the integrity of the holiday, which is partially intended as a reclamation of important African values. Today, many African American families celebrate Kwanzaa along with Christmas and New Year's. Frequently, both Christmas trees and kinaras, the traditional candle holder symbolic of African American roots, share space in Kwanzaa-celebrating households. For people who celebrate both holidays, Kwanzaa is an opportunity to incorporate elements of their particular ethnic heritage into holiday observances and celebrations of Christmas. Cultural exhibitions include the Spirit of Kwanzaa, an annual celebration held at the John F. Kennedy Center for the Performing Arts featuring interpretive dance, African dance, song and poetry. The National Retail Federation has sponsored a marketing survey on winter holidays since 2004, and in 2015 found that 1.9% of those polled planned to celebrate Kwanzaa – about six million people. In a 2006 speech, Maulana Karenga asserted that 28 million people celebrate Kwanzaa. He has always claimed it is celebrated all over the world. Lee D. Baker puts the number at 12 million. The African American Cultural Center claimed 30 million in 2009. According to University of Minnesota Professor Keith Mayes, the author of Kwanzaa: Black Power and the Making of the African-American Holiday Tradition, the popularity within the U.S. has "leveled off" as the black power movement there has declined, and as of 2009 between 500 thousand and two million Americans celebrated Kwanzaa, or between one and five percent of African Americans. Mayes added that white institutions now celebrate it. Starting in the 1990s, the holiday became increasingly commercialized, with the first Hallmark Card being sold in 1992, and there has been concern about this damaging the holiday's values. The holiday also saw a greater public recognition as the first Kwanzaa stamp, designed by Synthia Saint James, was issued by the United States Post Office in 1997, and in the same year Bill Clinton gave the first presidential declaration marking the holiday. The holiday has also spread to Canada and is celebrated by Black Canadians in a similar fashion as in the United States. According to the Language Portal of Canada, "this fairly new tradition has [also] gained in popularity in France, Great Britain, Jamaica and Brazil". Brazilian celebrations have been held in several cities. Stjepan Meštrović, a sociology professor at the Texas A&M University, sees Kwanzaa as an example of postmodernism. According to Meštrović, post-modernists in modern society may view "real" traditions as racist, sexist or otherwise oppressive, but since living in a world where nothing is true is too terrifying to most people, "nice" and "synthetic" traditions like Kwanzaa have been created to cope with the nihilistic, individualistic modern society. Maya Angelou narrated a documentary film about Kwanzaa, The Black Candle, written and directed by M.K. Asante, Jr. and featuring Chuck D, graduate of Goldsmiths university of London. ^ a b "Why Kwanzaa Video". "Maulana Karenga". Retrieved December 27, 2016. ^ Alexander, Ron (December 30, 1983). "The Evening Hours". The New York Times. Retrieved December 15, 2006. ^ Holly Hartman. "Kwanzaa – Honoring the values of ancient African cultures". Infoplease.com. Retrieved October 25, 2017. ^ Klein, Herbert S. (April 13, 1999). The Atlantic Slave Trade. Retrieved December 27, 2016 – via Google Books. ^ Mugane, John M. (2015). The Story of Swahili. Ohio University Press. p. 6. ISBN 9780896804890. ^ Mayes, Keith A. (2009). Kwanzaa: Black Power and the Making of the African-American Holiday Tradition. Routledge. p. 84. ISBN 9781135284008. ^ Mayes, Keith A. (2009). Kwanzaa: Black Power and the Making of the African-American Holiday Tradition. Routledge. p. 228. ISBN 9781135284015. ^ Mayes, Keith A. (2009). Kwanzaa: Black Power and the Making of the African-American Holiday Tradition. pp. 63–65. ISBN 978-0415998550. Retrieved December 27, 2015. ^ Karenga, Maulana (1967). "Religion". In Clyde Halisi, James Mtume. The Quotable Karenga. Los Angeles: University of Sankore Press. pp. 25. 23769.8. ^ Karenga, Maulana (1997). Kwanzaa: A Celebration of Family, Community and Culture. University of Sankore Press. p. 121. ISBN 978-0943412214. ^ Williams, Lena (December 20, 1990). "In Blacks' Homes, the Christmas and Kwanzaa Spirits Meet". The New York Times. Retrieved May 7, 2010. ^ Karenga, Maulana (2008). "Nguzo Saba". The Official Kwanzaa Web Site. Retrieved December 30, 2017. ^ Angaza, Maitefa (2007). Kwanzaa – From Holiday to Every Day: A complete guide for making Kwanzaa a part of your life. New York: Dafina Books. p. 56. ISBN 0758216653. ^ "The Symbols of Kwanzaa". The Official Kwanzaa Website. Retrieved January 9, 2016. ^ Raabe, Emily (2001). A Kwanzaa Holiday Cookbook. Rosen Publishing. p. 12. ISBN 978-0823956296. ^ a b Scott, Megan K. (December 17, 2009). "Kwanzaa celebrations continue, but boom is over, popularity fading". The Plain Dealer. Associated Press. Retrieved December 24, 2017. ^ Bush, George W. (December 23, 2004). "Presidential Kwanzaa Message, 2004". Office of the Press Secretary. Retrieved December 24, 2007. ^ "Clinton offers holiday messages". CNN. December 23, 1997. Retrieved December 24, 2007. ^ Gale, Elaine (December 26, 1998). "Appeal of Kwanzaa continues to grow; holidays: today marks start of the seven-day celebration of African culture, which began in Watts 32 years ago and is now observed by millions". Los Angeles Times. Retrieved December 24, 2007. ^ "The Founder's Message 2000". The Official Kwanzaa Web Site. Retrieved December 27, 2016. ^ "Useful Swahili phrases". Omniglot.com. Retrieved December 27, 2016. ^ "Kwanzaa (until Jan 1) in the United States". Timeanddate.com. Retrieved December 27, 2016. ^ "The Spirit of Kwanzaa – The John F. Kennedy Center for the Performing Arts". Kennedy-center.org. Retrieved December 27, 2016. ^ "Prosper Insights & Analytics™, Monthly Consumer Survey" (PDF). National Retail Federation. October 2015. ^ Manning Marable, Dispatches from the Ebony Tower, p. 224. ^ "Kwanzaa celebration unites African-American community", The Post, Ohio University, November 1, 2011. Accessed December 31, 2014. ^ Mayes, Keith A. (2009). Kwanzaa: Black Power and the Making of the African-American Black Holiday Tradition. Taylor & Francis. p. 248. ISBN 978-0415998543. ^ Martin, Douglas (December 20, 1993). "The Marketing of Kwanzaa; Black American Holiday Earns Dollars, Causing Concern". The New York Times. ISSN 0362-4331. Retrieved December 24, 2017. ^ "Commercialized Kwanzaa worries enthusiasts". The Billings Gazette. Retrieved December 24, 2017. ^ "William J. Clinton: Message on the Observance of Kwanzaa, 1997". www.presidency.ucsb.edu. Retrieved December 31, 2017. ^ Pleck, Elizabeth (2001). "Kwanzaa: The Making of a Black Nationalist Tradition, 1966–1990". Journal of American Ethnic History. 20 (4): 3–28. JSTOR 27502744. ^ "The principles of Kwanzaa". CBC. December 28, 1993. Retrieved December 16, 2011. ^ "Celebrate Kwanzaa!". Government of Canada. February 21, 2011. Retrieved December 16, 2011. ^ "The rising popularity of Kwanzaa in Brazil: Festa in celebration of African heritage catching on in cities like Salvador and São Paulo". Black Women of Brazil. February 21, 2011. Retrieved December 26, 2018. ^ S.G. Mestrovic (January 2000). "Postemotional Law". Ro.uow.edu.au. Retrieved December 27, 2016. ^ "Kwanzaa Celebration Captured In 'Black Candle'". National Public Radio. December 15, 2008. ^ "Chuck D and Maya Angelou in Kwanzaa Documentary". Essence. December 18, 2009. "The Meaning of Kwanzaa in 2003". The Tavis Smiley Show. NPR. December 26, 2003. Interview: Karenga discusses the evolution of the holiday and its meaning.